Genetic improvement of aluminum (Al) tolerance is one of the cost-effective solutions to improve wheat (Triticum aestivum) productivity in acidic soils. 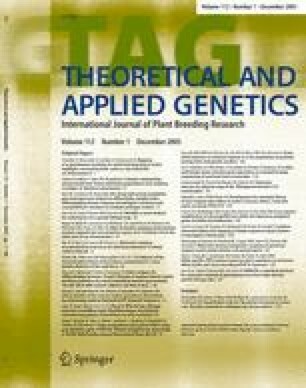 The objectives of the present study were to identify quantitative trait loci (QTL) for Al-tolerance and associated PCR-based markers for marker-assisted breeding utilizing cultivar Atlas 66. A population of recombinant inbred lines (RILs) from the cross Atlas 66/Century was screened for Al-tolerance by measuring root-growth rate during Al treatment in hydroponics and root response to hematoxylin stain of Al treatment. After 797 pairs of SSR primers were screened for polymorphisms between the parents, 131 pairs were selected for bulk segregant analysis (BSA). A QTL analysis based on SSR markers revealed one QTL on the distal region of chromosome arm 4DL where a malate transporter gene was mapped. This major QTL accounted for nearly 50% of the phenotypic variation for Al-tolerance. The SSR markers Xgdm125 and Xwmc331 were the flanking markers for the QTL and have the potential to be used for high-throughput, marker-assisted selection in wheat-breeding programs. This paper reports the results of research only. Mention of trade names or commercial products in this article is solely for the purpose of providing specific information and does not imply recommendation or endorsement by the U.S. Department of Agriculture. This is contribution No. 05-78-J of the Kansas Agricultural Experiment Station, Manhattan, KS, USA.